Seashore lupine occurs along the immediate coast and has a range that stretches from British Columbia to Northern California. Generally found at low elevations below 500 ft in areas with strong maritime influence. Locally, seashore lupine is an infrequent occupant along the coast. It can be found in the coastal portions of Pacific, Grays Harbor, Jefferson, Calallam, San Juan, Island, Skagit, and King Counties. L. littoralis is an early seral colonizer of beaches and sand dunes. It can tolerate the harsh sand blasts and salt spray characteristic of this environment. Seashore lupine can be found growing in conjunction with other beach colonizers such as Carex macrocephala, Poa macrantha, Glehnia leicarpa, and Polygonum paronychia. As with most lupines, seed collection should be carried out between July and August when the pods mature but before they shatter. Pods are mature when they turn a tan brown. Pods can also be collected slightly early if left attached to a portion of the stem and kept in a paper bag to mature. Seeds have a hard but brittle seed coat that requires some scarification to produce abundant germination. Mechanical scarification can be done but should be done lightly as the seeds are easily crushed in grinders or other devices. A hot water bath is very effective and can be done by heating a pot of water to boiling then removing from heat. Seeds can then be added to the water and left till cool. Seeds can be stored. Data on length of appropriate storage unavailable for this specific species. Other native lupine seeds can be stored for 20-60 years once cleaned and dried. Lupine seeds generally have a higher moisture content and should be stored at 40 degrees Fahrenheit and 40% relative humidity. Cleaned and dried seeds should be refrigerated and stored in airtight containers. 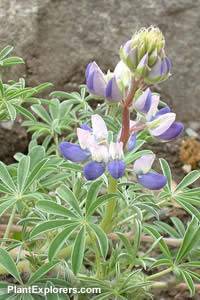 Seashore lupine prefers moist but well drained sandy soils and will generally grow well in full sun. Inoculation with Rhizobium specific to Lupinus spp. can aid overall success particularly when working with a sterile planting soil. Does not transplant well, seeds should be used. Seeds can be collected but are also commercially available. manual. University of Washington Press, Seattle. Collecting, Processing and Germinating Seeds of Wildland Plants. Young and Young. Timber Press. 1986. Kulmer, M.L. 1969. Plant Succession on the Sand Dunes of the Oregon Coast. Ecology, Vol. 50, No. 4. pp. 695-704. Skinner, David M. 2003. Propagation protocol for production of container Lupinus sericeus Dougl. ex Lindl. plants; Pullman Plant Materials Center, Pullman, Washington. In: Native Plant Network. URL: http://www.nativeplantnetwork.org (accessed 12 April 2006). Moscow (ID): University of Idaho, College of Natural Resources, Forest Research Nursery. Morris, Rich. “Lupinus littoralis - Douglas.” Plants for a Future.